Do you believe that silicone hydrogel materials are indeed a healthier option for your patients compared to hydrogel materials? If you are having problems voting, your email settings may be blocking you. Click here to vote through your browser. I recently saw a patient who had 0.75DC of refractive (spectacle) astigmatism in both eyes. She was wearing soft spherical contact lenses, and we asked if she had ever been offered toric lenses to correct her astigmatism. She replied that she did not know she had astigmatism. We then educated her, and she allowed us to show her the visual benefit of fitting her in a soft toric lens, which she immediately appreciated upon application of the lenses. The lesson learned for me here is that it is important to remember that these relatively simple cases can quickly provide an immediate benefit to your patients. Alden Optical, Inc. has signed an agreement to license manufacturing rights to both NovaKone, soft lens for keratoconus, and Zenlens, mini-scleral lens with Smart Curve, to UCO Lenzen, a well-respected soft and GP lens manufacturer in The Netherlands. UCO Lenzen will manufacture NovaKone and Zenlens under license from Alden and distribute both lenses in The Netherlands and Belgium. Further, UCO Lenzen will manufacture lenses for Six Six Contacts Limited for distribution in the United Kingdom and for Sanalens for distribution in Italy. Availability of NovaKone and Zenlens in the markets mentioned is expected to be solidified by September, 2014. 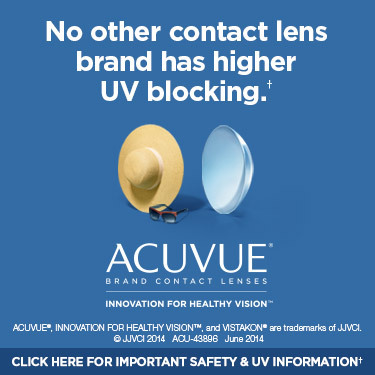 For additional information on NovaKone and Zenlens contact lenses visit www.aldenoptical.com. The Association of Schools and Colleges of Optometry (ASCO) announced the recipients of the 2014 Special Recognition Awards. Sponsored by Oculus, the ASCO Rising Star Award is given to an outstanding faculty member or administrator with less than 10 years of service. Dr. Yi Pang, Assistant Dean for Research and Associate Professor, Illinois College of Optometry, was recognized for her outstanding contributions to ASCO, most notably in the area of international optometric education and for her achievements at ICO. Named after Dr. Jack Bennett, a creative leader in optometric education who served as dean at three optometric institutions, ASCO’s Dr. Jack Bennett Innovation in Optometric Education Award recognizes an ASCO volunteer for an outstanding innovation in optometric education through ASCO. Dr. Barbara Fink, Associate Professor of Optometry and Vision Science and Chair of the Diversity Enhancement Committee, The Ohio State University College of Optometry, received the award in recognition of her outstanding work to facilitate the implementation of the ASCO Cultural Competency Curriculum Guidelines at the schools and colleges of optometry. Plan now to attend the Global Specialty Lens Symposium to be held January 22 – 25, 2015 at Bally's Hotel and Casino in Las Vegas, Nevada. This meeting will include insightful presentations by international experts in the field, hands-on demonstrations of cutting-edge products and valuable continuing education credits. The Program Committee of the GSLS invites the submission of Papers and Posters. Papers and abstracts related to presbyopia, keratoconus, corneal topography, post penetrating keratoplasty or related irregular corneal surface, myopia control, orthokeratology and lens care topics are welcome. To submit a photo for the photo contest, submit up to two (2) photographic images in the following anterior segment categories: Contact Lens and Cornea/Conjunctiva/Lids. Contestants also will be able to submit images obtained utilizing such equipment as OCT, topographers, etc. Visit www.GSLSymposium.com for more information. Web submissions only. Deadline for submissions is August 31, 2014. Nicox S.A. announced that Nicox’s subsidiary, Nicox Inc, will focus its U.S. sales force on supporting the national roll-out of Sjö, an advanced diagnostic panel for the early detection of Sjögren’s syndrome in patients with dry eye, and on promoting the RetnaGene portfolio including RetnaGene AMD and RetnaGene LR, specialized genetic tests which assess an individual’s risk for advanced age-related macular degeneration (AMD). Nicox and Rapid Pathogen Screening (RPS) have therefore agreed to restructure the terms of their partnership in North America. Effective August 1st, 2014, RPS will resume responsibility for marketing AdenoPlus, a point-of-care diagnostic test that aids in the differential diagnosis of acute conjunctivitis, to eye care professionals in North America, as well as two other diagnostic products currently in development. RPS will pay a royalty on sales to Nicox. Nicox will continue to have rights to commercialize AdenoPlus and the previously licensed development products in all markets outside of North America. Optometry Giving Sight is pleased to announce the appointment of Eric Anderson as Chief Development Officer for North America. Anderson is a senior development leader with more than 25 years’ experience in all aspects of fundraising management with special emphasis on the cultivation, solicitation and stewarding of major gifts and planned giving. Anderson will focus on working to increase fundraising capacity in the USA, Canada and Mexico. Clive Miller, Optometry Giving Sight CEO, identified support for the establishment of new Schools of Optometry in Haiti and southern Mexico as priority projects for the organization over the next few years. Anderson‘s previous appointments include the American Indian College Fund (Denver, CO), University of Wisconsin-Milwaukee, The Medical College of Wisconsin (Milwaukee) and Carroll College (Waukesha, WI). The American Optometric Association (AOA) is gearing up for next year’s Optometry’s Meeting, which will be held in Seattle, Washington from June 24-28, 2015, and is calling for the submission of continuing education (CE) courses to be offered at the meeting. The courses may cover a wide variety of ophthalmic topics, and all abstracts must be submitted electronically via online submission by August 8, 2014. To view course requirements and to submit a course, visit www.optometrysmeeting.org/2015-call-for-courses. If you have questions regarding the call for courses, please contact Stacy Harris, AOA Education Manager, at continuing-ed@aoa.org. We received this commentary on the Care Solution Corner column from last week’s issue. I would like to congratulate Dr. Susan J. Gromacki and Dr. Langis Michaud for the interesting column, Tap Water and GP Contact Lenses: “The MIddle of a Gray Zone”. The points covered by Dr. Langis are really important to consider; my conclusion is that it is of utmost importance that practitioners not only have to pay attention to the achieve the best possible fitting but also to the conditions the patients face in their life, geographical location, habits and compliance. 1. The patient should always properly wash their hands prior to insertion/removal of their GPs. This is basic but it is important and should be always mentioned to the patient (verbally and written). 2. We instruct the patient after removal of their lenses to use a neutral, balanced pH detergent or shampoo mixed with tap water using the finger to make a light, circular friction to clean their lenses eliminating the invisible film of protein deposits that tend to adhere to the lens surface. The the patient is instructed to rinse their lenses in tap water, no problem so far. 3. Now the patient is instructed to use a multi-purpose product of choice to have a complete asepsis of the lens before storing it in the lens case. 4. The patient is also instructed to clean the lens case at least once a week. 5. It is very common that our patients keep a healthy, crystal clear cornea for about 2 – 3 years or even more sometimes, with comfort and overall corneal physiological health. 6. We never use plasma gas treatment for supercleaning the GP lenses. I hope that this adds some thoughts about the subject. I sincerely respect any other opinion regarding this very delicate issue. Ever apply, and apply more fluorescein for tonometry and be frustrated that the mires are barely visible? That’s fluorescein quenching; the phenomenon of reduced fluorescent efficiency at high concentrations of fluorescein (Nichols et al, 2012). Fluorescein is subject to quenching, or dampening of the emitted signal strength, by various factors. One such factor is self-quenching, in which individual fluorescein molecules dimerize above a given critical concentration, resulting in a non-fluorescent complex. Because of quenching effects, fluorescein does not exhibit a strictly linear concentration vs. fluorescence relationship. We see this clinically for example, when we apply fluorescein from a strip to an eye with a thinned pre-corneal tear film as in dry eye. Fluorescein that has been concentrated in the thinned tear film becomes virtually invisible under the cobalt blue filter. The cure for this is a drop of artificial tear or the like to the cul-de-sac to dilute the applied stain to allow you to once again see the green glow. Nichols JJ, King-Smith PE, Hinel EA, Thangavelu M, Nichols KK. The use of fluorescent quenching in studying the contribution of evaporation to tear thinning. Invest Ophthalmol Vis Sci.2012 Aug 20;53(9):5426-32. Ward K. Superficial Punctate Fluorescein Staining of the Ocular Surface. Optom Vis Sci. 2008 Jan;85(1):8-16. Today patients with progressive corneal ectasia can be successfully managed with corneal collagen cross linking treatments, however a minimum corneal thickness of 400 microns or greater is typically felt to be required in order to avoid potential damage to the corneal endothelium from the ultraviolet light used in the treatment. Outcomes from a study that evaluated a novel new technique to treat patients with corneas thinner than 400 microns called Contact Lens-Assisted Collagen Cross Linking (CACXL) was recently published. Patients diagnosed as having progressive keratectasia with a minimum corneal thickness less than 400 and greater than 350 µm after epithelial debridement were included in this study of CACXL. After epithelial debridement (i.e. utilizing an “epi-off” method of cross linking), iso-osmolar riboflavin 0.1% in dextran was applied every 3 minutes for 30 minutes. An ultraviolet barrier-free soft contact lens (0.09-mm thickness, 14-mm diameter) that was soaked in iso-osmolar riboflavin 0.1% for 30 minutes was placed on the cornea. Once the minimum combined thickness value was confirmed to be greater than 400 µm, the ultraviolet-A irradiance was started along with instillation of iso-osmolar riboflavin 0.1% in the pre-corneal and pre-contact lens region. Intraoperative minimum corneal thickness changes were recorded with ultrasound pachymetry and optical coherence tomography. Postoperative visual acuity, corneal topography (Orbscan; Bausch & Lomb, Rochester, NY), and endothelial cell loss (EM-3000; Tomey, Nagoya, Japan), were measured. Fourteen eyes underwent the procedure. Mean preoperative minimum corneal thickness after epithelial debridement was 377.2 ± 14.5 µm (range: 350 to 398 µm). There was a significant difference in minimum functional corneal thickness (Friedman test, P = .000) intraoperatively, before and after epithelial debridement, and with contact lens and riboflavin film. Mean minimum functional corneal thickness after the contact lens was 485.1 ± 15.8 µm (range: 458 to 511 µm). Mean absolute increase in the minimum corneal thickness along with the contact lens and pre-corneal riboflavin film was 107.9 ± 9.4 µm (range: 90 to 124 µm). There was no significant endothelial loss (P = .063) and the corneal topography was stable at the last follow-up (P = .505). The researchers concluded that the CACXL technique was safe and effective for patients with corneas less than 400 microns. Jacob S, Kumar DA, Agarwal A, Basu S, Sinha P, Agarwal A. Contact lens-assisted collagen cross-linking (CACXL): A new technique for cross-linking thin corneas. J Refract Surg. 2014 Jun;30(6):366-72. Several methods have been proposed to achieve an extended and controlled release of ocular therapeutics via contact lenses; however, the experimental conditions used to study the drug release vary greatly and significantly influence the release kinetics. In this paper, researchers examine variations in the release conditions and their effect on the release of both hydrophilic and hydrophobic drugs (ketotifen fumarate, diclofenac sodium, timolol maleate and dexamethasone) from conventional hydrogel and silicone hydrogel lenses. Drug release was studied under different conditions, varying volume, mixing rates, and temperature. Volume had the biggest effect on the release profile, which ironically is the least consistent variable throughout the literature. When a small volume (2-30mL) was used with no forced mixing and solvent exchange every 24 hours, equilibrium was reached promptly much earlier than solvent exchange, significantly damping the drug release rate and artificially extending the release duration, leading to false conclusions. Using a large volume (200-400mL) with a 30rpm mixing rate and no solvent exchange, the release rate and total mass released was significantly increased. In general, the release performed in small volumes with no force mixing exhibited cumulative mass release amounts of 3-12 times less than the cumulative release amounts in large volumes with mixing. Increases in mixing rate and temperature resulted in relatively small increases of 1.4 and 1.2 times, respectively in fractional mass released. The researchers concluded that these results strongly demonstrate the necessity of proper and thorough analysis of release data to assure that equilibrium is not affecting release kinetics. This is paramount for comparison of various controlled drug release methods of therapeutic contact lenses, validation of the potential of lenses as an efficient and effective means of drug delivery, as well as increasing the likelihood of only the most promising methods reaching in vivo studies. Tieppo A, Boggs AC, Pourjavad P, Byrne ME. Analysis of release kinetics of ocular therapeutics from drug releasing contact lenses: Best methods and practices to advance the field. Cont Lens Anterior Eye. 2014 Aug;37(4):305-13. Epub 2014 Jun 2.